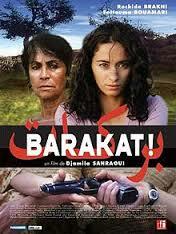 Set in 1990s when Algeria is in the middle of a civil war, Barakat! follows two women, Amel, a doctor, and Khadija, a women who fought against the French for independence as a young girl. Believing Amel’s husband to be captured by Islamic terrorists, they band together for their search for Amel’s husband. During their search, they come into conflict not only with terrorists, but with each other. With a difference in how they live their lives and their political views, they struggle to work together in order to save amel’s husband.